Well… it has happened. Tapwave is slapping the mat and crying uncle. After spending a couple of years trying to get their Zodiac game-oriented PalmOS handhelds to take hold of the market Tapwave is getting out of the business. They had mentioned doing work for OEM partners, but as Engadget states, a statement on their homepage points toward bankruptcy. This is a true shame, as the Zodiac really pushed the envelope in a lot of areas for it’s class of products. 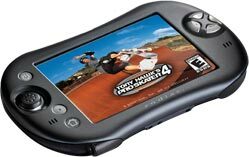 Just take a look at what the PSP is now, and know that the Zodiac had many of the same features two years ago (though it obviously lacked the very impressive graphics hardware packed into the PSP).